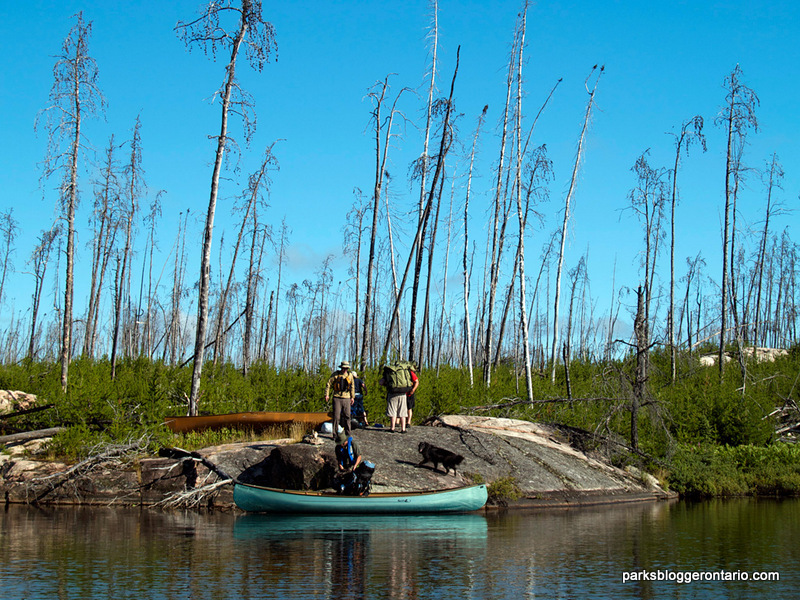 Canoe camping in Woodland Caribou Provincial Park is a paddlers dream come true. This Ontario park is rated as wilderness with no roads, bridges or other man-made infrastructure. The one exception being several fishing lodges scattered throughout the park. The lodges are only accessible by float-plane. There is no logging, which I might add is quite refreshing as it can spoil the mood in a heartbeat. Woodland Caribou PP is huge, encompassing 4,500 square kilometres of boreal forest and sub-arctic watersheds. 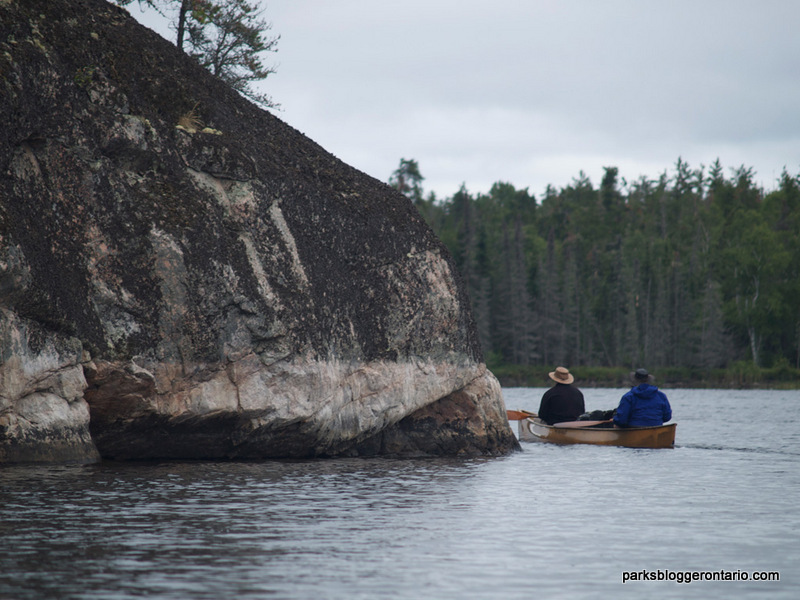 There are nearly 2,000 kilometres of ‘maintained’ canoe routes in a park that apparently sees fewer then one thousand paddlers per season – truly a haven for the paddler looking for a remote setting. When I say ʻmaintainedʼ, it usually means that a portage may or may not be crossable, just finding a portage can be a real chore in-itself! Upon landing in the park via a turbo beaver float plane, we unloaded our canoes and gear in the middle of Paull Lake (yes, thatʼs spelt with two “L”ʼs). As we disembarked from the plane we began our canoe journey. 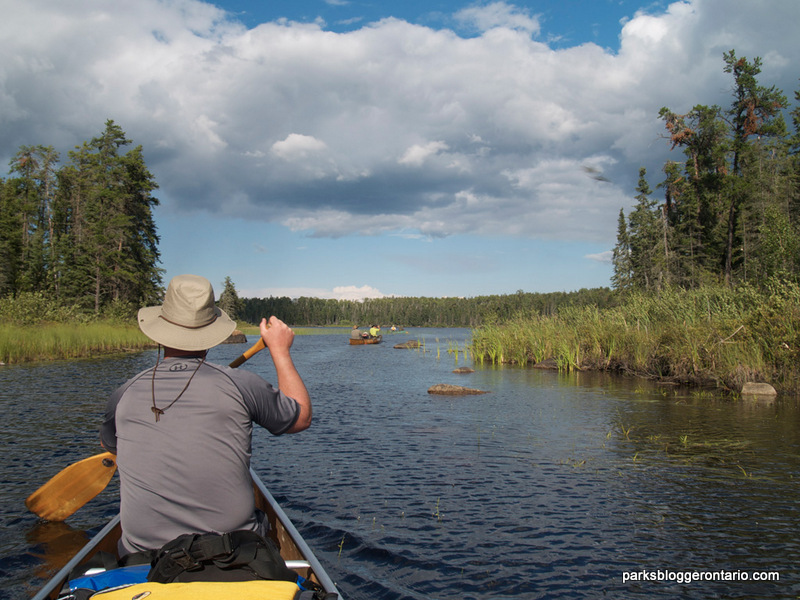 I am familiar with a more southerly provincial park, namely Algonquin Park and in those first few minutes of paddling Woodland Caribou Provincial Park I could already see the difference: the pines I was most familiar with were gone! The tall white and red pines of Algonquin Park were replaced by spindly jack pine. Everywhere I looked I saw jack pine. I had never seen so much of it before. Then there was the rock. 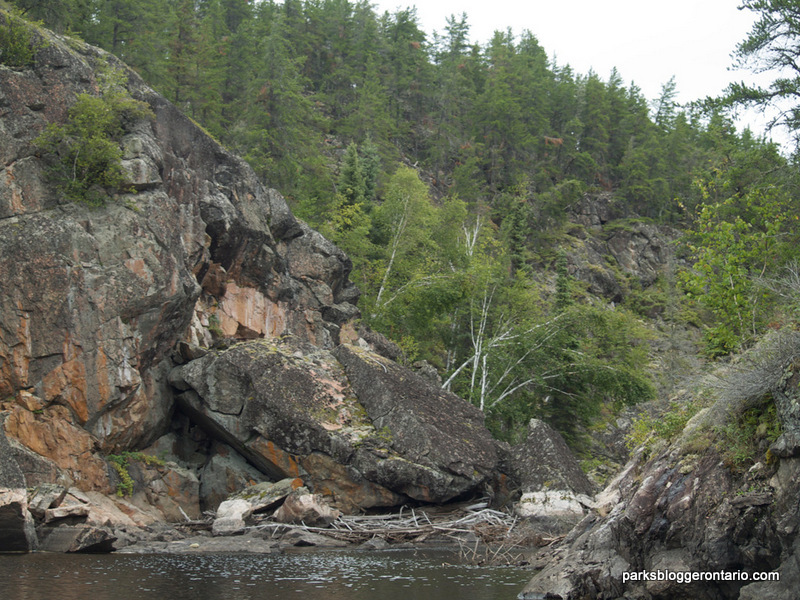 Along every shoreline was ancient Canadian Shield rock, more then I had ever seen in my lifetime. For the next two weeks this is what I saw daily and lots of it. It may come as a surprise (it did to me), but there is very little soil in Woodland Caribou PP. Most of the ʻlandʼ consists mainly of Canadian Shield rock covered by a layer of moss upon which the trees grow, clinging to the rock surface beneath. Oddly, the further north we travelled the more soil we encountered, giving way to several different species of trees; aspens and birch and the occasional balsam fir. Surprising, because the layer of soil was quite thin. It is a miracle any of the trees mentioned above can exist in such harsh soil conditions. Overall, the landscape gave me the impression of a great weight that had pressed itself down upon the rock; everywhere we paddled that there was Canadian Shield the tops of the hills appeared to be flattened. I surmised that with so little soil in the region, past glacial movements and erosion were limited by the hard rock of the Canadian Shield. Sure, there were hills but all hills ended at roughly the same elevation, this is what gave me the ʻflattenedʼ impression. This ‘flattened’ look of the land was further enhanced when we travelled through burn areas, giving one the feeling of travelling through an empty landscape, seemingly devoid of life. We saw two sandhill cranes flying in the sky above the jack pines, their calls croaking over the silent land below. This magnified the emptiness and transformed the scene into one with an ancient and almost pre-historic feeling. It was quite eerie to experience and still brings back the sense of complete isolation when I recall this trip. It was the only time during our journey that we saw such massive birds flying above the lifeless landscape. What an amazing sensation it was to experience! I did experience another area of Woodland Caribou where the land wasn’t so flat. This was the Haggart River. As we travelled north of Bulging Lake down this river towards Carroll Lake, the landscape became more eroded. This offered a more ‘gorge-like’ view in places as we descended in elevation and the river cut through the bedrock. There were several portages that I would deem treacherous in a few places as we navigated down the Haggart River. One must take great care when negotiating the trails with a canoe on their back. North of Carroll Lake we saw aspens for the first time as well as balsam fir trees. The further north we travelled the forest started to look more like Algonquin Park. However, through it all was the Canadian Shield, probably the single most prominent feature of Woodland Caribou Provincial Park. The Jack pines came next and were everywhere I looked. This vision is forever etched into my mind. Travelling on land via these portages was a unique experience. Many of the portages were short (when compared to Algonquin Park), but were quite rocky and steep. In some areas the rock was moss-covered and could be very slippery when wet. Great care must be taken when traversing these trails; an emergency airlift from the region might be days away or longer, not mere hours as one might expect further south in Ontario. Finding portages was half the battle as with campsites in the region none of the trailheads were marked. There are no signs or markers. The most you could hope for was a blaze in a tree or an inukshuk; in its simplest form a pile of three or four rocks and that was it. Travelling through the area with a map and a GPS device is highly recommended. This is wilderness travel and one is truly on their own in Woodland Caribou Provincial Park. Pretty much all of the take-outs/put-ins for the portages we crossed were not easy. Terrain was the main factor in making the task more difficult; Rock being the obstacle to overcome, the other was size. The majority of take-out/put-ins could accommodate only one canoe at a time. So it was with our party of three canoes that dealing with portages was the slowest part of our day. In most cases my canoe was last and this equated to occasional waits of up to 10 minutes. No problem – out came the fishing rod and more often then not a decent sized pike was caught. NICE. 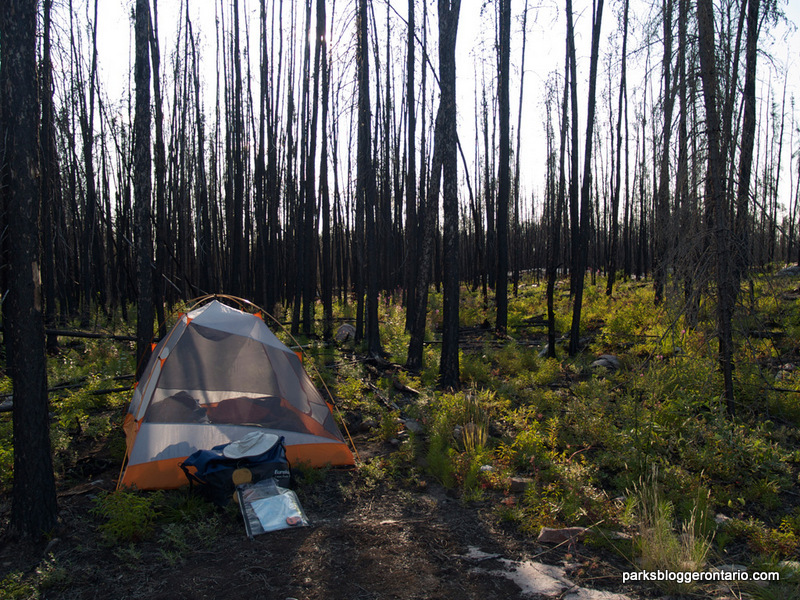 Finding campsites is another interesting challenge when camping in a wilderness park setting. Because of the lack of soil in the region, there isn’t any obvious well-worn paths onto a campsite that one would look for from the water. Campsites are not marked with any signage. The only way to find a campsite is to search for a campfire ring and to download or purchase maps beforehand that have ‘well-known’ campsite locations marked. It is up to the party to locate a campsite or to make their own campsite, which is completely legal to do in the wilderness setting of Woodland Caribou Park. I must stress that with camping in a wilderness setting, ʻleave no traceʼ practice becomes even more important to follow. Garbage left behind will most likely never be cleaned up. I am very happy to report that not once did we encounter garbage during our 16 day trip! Typically, we found most campsite locations that we visited in the park to be small. Small as in suitable tenting space available. 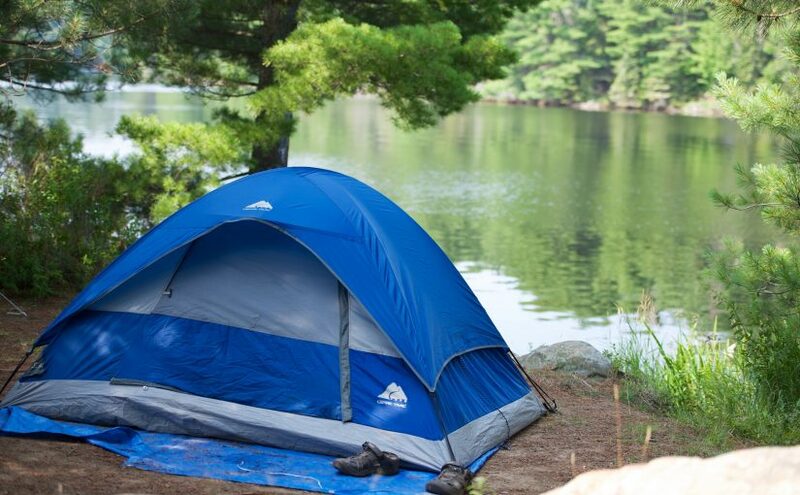 Often we found campsites accommodated two tents at the most. Trying to fit a third tent in was a chore in most cases as the sites were simply too small, cluttered with deadfall and/or the terrain rough and uneven. Added to the roughness of the landscape was the lack of wildlife and people. One truly feels they are in a remote area (And we really were! ), when travelling through the subarctic watersheds of the park. During our travels we did not encounter anyone camped anywhere on our sixteen day long trip. It was only on days four, ten and thirteen that we encountered fellow canoeists paddling while we were on the move. Even then I was told at the time that was a lot of people to comes across. I truly felt at ease in the park and loved the experience of new and wild landscapes, most importantly was the lack of people. The lack of wildlife sightings was a disappointment. Spotting our first and only moose of the trip on day twelve, I was awed – The spectre of seeing a moose having never lost it splendour upon me. Seeing a moose and knowing it existed in a much harsher environment than I was used to seeing one survive in, hit home to me the importance of this remote setting. Our ‘wild’ places in Ontario are shrinking and I felt very fortunate to visit such a wild and remote place for the first time. I plan to return to the park in 2015. The long journey to the region (and back) is very much worth the effort. 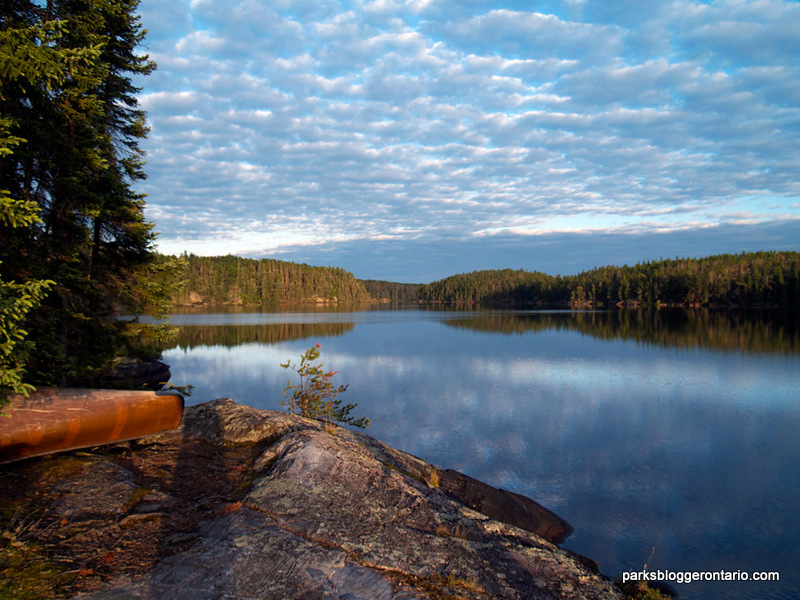 Mark is an avid Algonquin Park canoeist, photographing and writing about his journeys online at markinthepark.com. 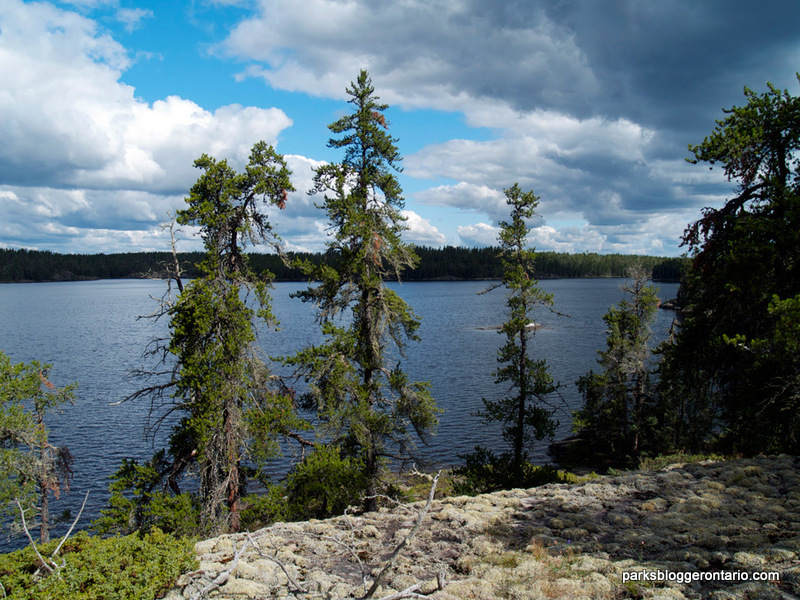 Woodland Caribou PP is a new experience for Mark, one that he wishes to explore further.